Before you become an expert Galaxy Tab user, you must first learn to find the basic command buttons and other features on your Galaxy Tab. Dock/USB power connector: The key to discovering things on your Tab is to first find the Power/USB jack. It’s a thin slot located on the long side of the Tab. 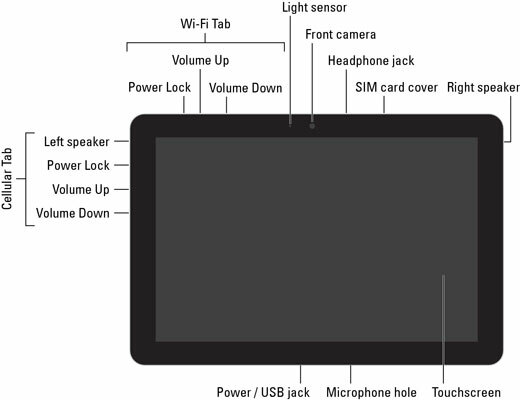 Because the Tab has no buttons or other easily identifiable marks on its front, locating the Power/USB jack first helps you orient the Tab as well as locate its other features. The slot is also where the Tab connects to the dock, if you have one. Touchscreen display: The biggest part of the Tab is its touchscreen display, which occupies almost all the territory on the front of the device. The touchscreen display is a see-touch thing: You look at it and also touch it with your fingers to control the Tab. Front camera: The Galaxy Tab’s front-facing camera is centered above the touchscreen. The camera is used for taking self-portraits as well as for video conferencing. Light sensor: Though it’s difficult to see, just to the left of the front camera is a teensy light sensor. It’s used to help adjust the brightness level of the touchscreen. Headphone jack: Atop the Tab case, you see a hole where you can connect standard headphones. SIM card cover: This spot is used to access the cellular Tab’s SIM card, which is inserted into a slot beneath the cover. Speaker(s): Stereo speakers are located on the left and right sides of the Tab. Microphone: A tiny hole on the bottom of the Tab is where you find the device’s microphone. Volume Up/Volume Down: The Tab’s volume control is located on the right side of the cellular unit, just below the Power Lock button. On the Wi-Fi Tab, the volume control is on top of the unit. Power Lock: The Power Lock button is labeled with the universal power icon. Press this button to turn on the Tab, to lock it (put it to sleep), to wake it up, and to turn it off. The back of the Galaxy Tab mostly boring except for the device’s main camera. In fact, the entire Tab is physically boring front and back; all the real goodies are found on its edges. The back of the Galaxy Tab can be black or white, which is a choice you make when you buy the device. There is no internal difference between the black or white Tab. The Power Lock and Volume buttons are in different locations for the cellular and Wi-Fi Tab models. You’ll rarely, if ever, access the SIM card.